The Minister of State Patrick O’Donovan had put forward plans for gender quotas for sporting bodies. THE DEPARTMENT OF Transport, Tourism and Sport has set out its strategy from 2016 – 2019 – and promises progressing the New Metro North and getting more Irish people moving. The strategy, which can be read here, was released today. 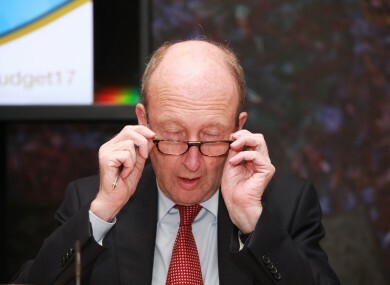 Minister for Transport, Tourism and Sport, Shane Ross, said that the first six months of his time as Minister in the Partnership Government “have been eventful, challenging and fulfilling”. All elements of our new government are working well together and though we face many challenges ahead we are more than ready to meet them. He said that his department is committed “to successfully managing the many day-to-day issues affecting our transport network and also to ensuring that we have a vision for the future”. Interestingly, the strategy does not contain mention of the plans for gender quotas for state sporting boards, which were mooted by Minister of State Patrick O’Donovan. The reaction to O’Donovan’s proposal was mixed, and the Irish Times later reported that Ross said that he did not favour punitive measures on the issue. Under O’Donovan’s plan, bodies who do not adhere to the quota would have state funding cut. This plan is not mentioned at all in the strategy plan. So, what else can we expect? Completion of the Luas Cross City project and progression of the New Metro North. It also plans to associate vehicle and driver records “in order to achieve optimum penalty point endorsement”. We will invest €3.6billion across the lifetime of the next Capital Plan to enable a number of major public transport projects to proceed, and to fund additional capacity to meet existing and future commuter needs. These will include the new Metro North and the completion of LUAS Cross City. A provision will also be introduced where taxi companies who wish to bid for state procurement contracts must ensure that a minimum of 10% of their fleet is wheelchair accessible. The strategy aims to have fewer single occupancy vehicles and more commuters walking and cycling, as well as a greater uptake of sustainable modes of travel (walking, cycling and public transport). We also recognise the value and benefit of rural transport to many communities, in particular for older people vulnerable to social isolation. We will examine how best to improve integration of services in the rural bus network, including public buses, school transport and the HSE transport networks. This sector contributes €4.1bn to our GDP, but the strategy notes that the global economic downturn had a significant negative impact on aviation across the world. Dublin Airport is experiencing exceptional growth, Shannon Airport had a third consecutive year of growth in 2015 – with numbers up 5% – but Cork Airport passenger numbers only returned to growth in 2016. The intended withdrawal of the UK from the EU has potentially wide-ranging implications for Irish aviation and for connectivity. Insofar as the legislative framework for aviation is concerned, our focus will be on minimising the potential for negative impacts for the aviation industry or wider economy. The plan includes implementing the national ports policy and the transfer of ports to local authorities. There are already three targets to be achieved by 2025 according to the government’s tourism policy statement, which was launched in March 2015. Goals from 2016 – 2019 include attracting major international events, enhancing indigenous events and growing business tourism. It is also planned to carry out an independent evaluation of Ireland’s overseas tourism marketing expenditure. One major goal for sport in Ireland is to develop a national sports policy to provide a policy framework for sport. It also wants to develop facilities at the national sports campus, including the first phase of the national indoor arena. It says that it aims to increase participation in physical activity by 1% per annum to 2020, and funding will help this. The development of high performance sport in Ireland is another key aspect of our overall sports strategy. A vital element of our policy is the provision of a clear anti-doping framework through Sport Ireland in order to ensure the credibility of Irish sport both nationally and internationally. Email “Shane Ross outlines his department's plans - but no mention of gender quotas for sports boards”. Feedback on “Shane Ross outlines his department's plans - but no mention of gender quotas for sports boards”.